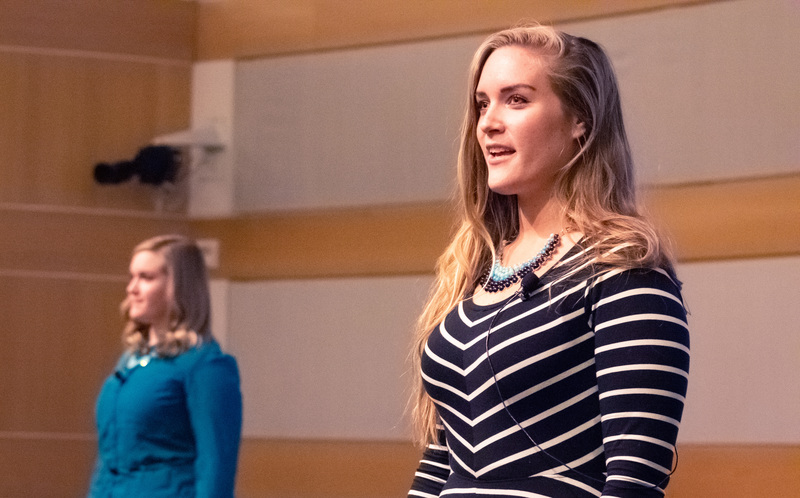 Beauty Redefined is the academic and personal passion of Lexie Kite and Lindsay Kite, 31-year-old identical twins with PhDs in the study of media and body image. One of the most powerful ways BR impacts individuals across the country is through in-person speaking engagements. We have traveled across the U.S. since 2009 offering a powerful visual presentation to tens of thousands of people in large groups of all sorts, including universities, school districts, treatment centers, religious congregations and corporate events. Through a one-hour visual presentation, we teach crucial skills for media literacy while helping people of both genders and all ages (10+) to recognize and reject harmful messages about bodies and health in media. Our past and upcoming speaking schedule is available here. While many well-intentioned speakers address the development of positive body image from the basis of helping women realize and embrace their beauty, we take a different approach that has proved successful in our research. At Beauty Redefined, we assert that having positive body image isn’t believing you are beautiful. Instead, it is having a positive perception of your body overall. So many times we confuse “my body” with “how my body looks” and think of ourselves from an outside perspective. As described above, this self-objectification showed up in more than 3/4 of our doctoral study participants from the very first question. Through both research and personal experiences, our visual presentation illustrates the vital point that your body is far more important and powerful as an instrument for your use than it is as an ornament to admire. Self-esteem and confidence are crucial, but they are NOT dependent on what you look like — or what you think you look like. We emphasize that getting past the obsession with the outsides of our bodies is key to developing a positive perception of our own bodies, which is the definition of positive body image. Our engaging, live presentation is entirely backed by up-to-date research on body image, media literacy, health and fitness, and body image resilience. Audiences leave feeling empowered to implement strategies in four different areas to harness their body image resilience and live life as more than bodies to be looked at, fixed, and judged. Our visual presentation is entirely backed by up-to-date research on body image, media literacy, health and fitness, and resilience. Appropriate for all ages 10+, the visual and textual content is suited for school, religious, and professional settings. We do not use explicit images or specific numbers to represent sizes, weights or measurements of beauty or health ideals. We tailor each presentation for each audience, and the structure of the presentation can be modified depending on the setting. We regularly speak on panels, as keynote speakers for conferences, at school assemblies, and give informal talks in a variety of settings for both genders and all ages. To inquire about costs and availability for booking Lindsay and Lexie Kite for your school or organization, please use the contact form below. If you are part of a school or group who might be interested in hosting a presentation, please refer an administrator or decision-maker to this page to contact us.